Roulette catches up with artist Gof Parnmaonkol for a quick Q+A about his favorite artists, the best places to eat around Roulette, and his favorite spots in NYC. What is the best way to spend an afternoon in New York City? What is your favorite place to eat or drink near Roulette? Bedouin Tent (Middle Eastern; 405 Atlantic Ave at Bond St) and Ganso Ramen (Japanese; 25 Bond St at Livingston St). Who would you ideally like to collaborate with? What is your absolute favorite place in the city to be? Issue No. 004 of Roulette’s Zine is Here! Fall zines have arrived and they are jam-packed full of new + exclusive content, including a feature on Phill Niblock​ from Kurt Gottschalk​, an interview with MSHR from Mia Wendel-DiLallo​, artist spotlights, season calendar, neighborhood dining recommendations, a word search, and much more. 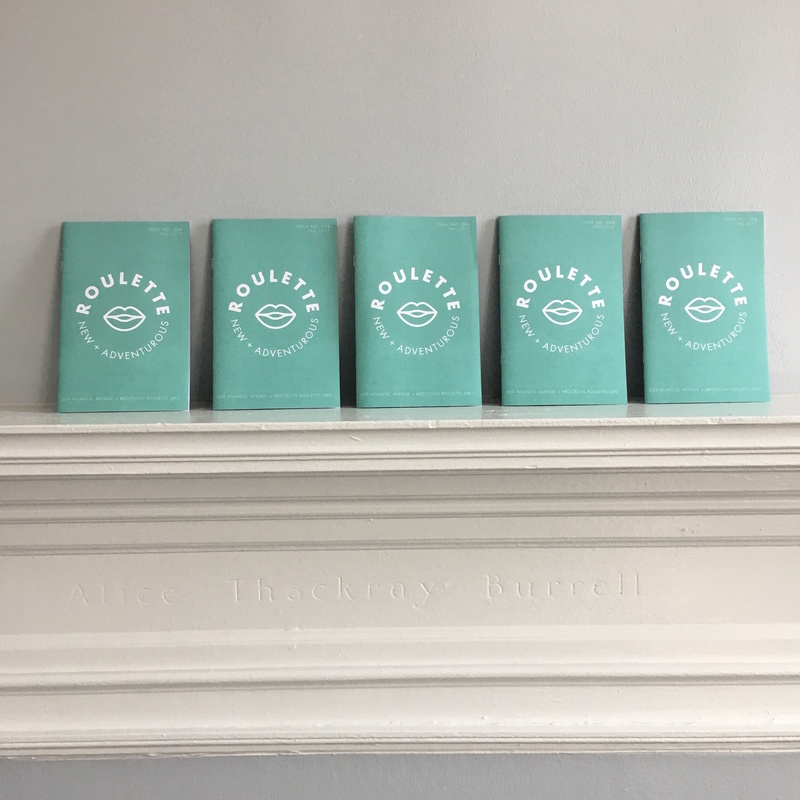 Pick up your copy in the lobby before a performance and keep your eyes pealed for these seafoam beauties around town. In honor of her 70th birthday, vocalist and composer Joan La Barbara premieres a new piece for the stage — “The Wanderlusting of Joseph C.” — an epic song cycle materializing from the life, work, and dreams of the reclusive visual artist Joseph Cornell. For her followers, the work will be a surprising departure from the virtuosic vocal abstractions that they have come to know. Joan’s performances typically undulate from wordless whispers, warbles, and hums to her famous circular breathing acrobatics, examining the use of the voice-as-instrument in resonant pulsations of sound. By contrast, “The Wanderlusting of Joseph C.” returns in cyclical fashion to the artist’s interest in language itself. The libretto, written by author Monique Truong, unravels the tragic nature of Cornell’s personal relationships, and is sung by a collection of greats from the operatic world, including opera diva Lauren Flanigan, baritone Mario Diaz-Moresco, and the young soprano Julia Meadows. Music will be played by Ne(x)tworks, with cellist Yves Dharamraj, harpist Shelley Burgon, Miguel Frasconi on glass, flute, and laptop, pianist Stephen Gosling, trombonist Christopher McIntyre, and Joan La Barbara herself performing vocals. Joan first became acquainted with Cornell through his melancholy shadow-box collections of trinkets, letters, toys, and photographs, but it wasn’t until she was sent a book of his dreams that she truly came to know him. The collection, which included fragments from his journals extracted by editor Catherine Corman, was sent to Joan from Exact Change publishing house as a request that she create a work inspired by one of their publications. Joan began to play with the excerpts, seeing what music they could reveal, and ended up composing “Habité par ses rêves et les phantasms,” for voice and hand-held percussion which she premiered in 2009 at Issue Project Room. Like Cornell’s shadow-box pieces, the fragments provided a unique window into his world, and served as a jumping off point for Joan’s research into his life. Biographies such as Deborah Soloman’s “Utopia Parkway,” aptly named after the street that Cornell lived on in Flushing, Queens, further fleshed out his complex character for Joan. Cornell’s life was stunted by an unhappy childhood, and as a result he never strayed too far from New York. He would spend hours wandering the city, scanning thrift stores, streets, and the Queens shoreline in search of the objects one sees populating his work. The little bottles that crop up in the boxes came from these expeditions, as do odds and ends ranging from scissors and small figurines to the “leftovers” from the 1939 World’s Fair held in Flushing. He would then take his spoils home with him and categorize them, and the objects would become his mind’s travelogue. Dream-like themselves, the shadow-boxes created a purely imagined universe — one in which Cornell could live out the life he could never have. The shadow-boxes illustrate a “wanderlusting,” a coined word found within Cornell’s personal writings, in their desperate focus on distant places, intimate fan letters to famous actresses and ballerinas, and uncanny collaged creations of objects and images. In German, wanderlust is defined as a strong and innate desire to wander or travel. While this definition gives agency to the wanderer, it does, perhaps as in Cornell’s case, show the hopelessness of achieving true satisfaction in wandering. Through his artistic creations Cornell could portray a freedom that he could not find himself, and it is this passion and pain that lead Joan to her opera. “The Wanderlusting of Joseph C.” was born from a creative process that Joan has honed for years: making lists. She begins every piece by writing down lists of her ideas. These verbal collections are sometimes borrowed from other people’s written or spoken words, but are mostly her own fragmentary contemplations. She then works over the fragments to discover where the music calls out to her. Over the course of her career she has compiled thousands of these lists, mixing and matching a collage of her selected thoughts and ideas to form the whole of the piece. 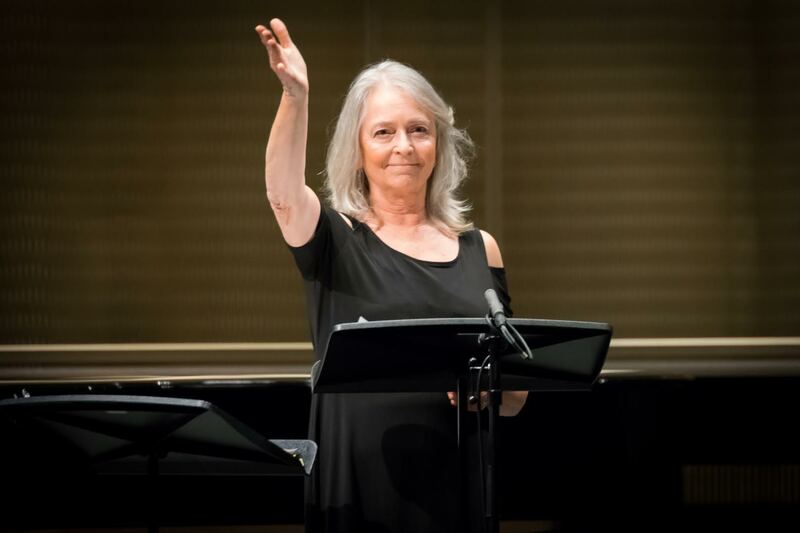 Although she doesn’t consider herself a researcher or historian, Joan’s recent ensemble works have been heavily focused on the excavation of real events through lyrics. “A Murmuration of Chibok,” with lyrics also written by Monique Truong, was created by Joan as a way of honoring the memory and willpower of the over 250 girls abducted by Boko Haram in 2014. To not let the world forget their voices, Joan imagined the joy and laughter of the girls right before their kidnapping, returning to school with lively innocent calls and chatter to each other. The piece, which was presented in 2016 at both National Sawdust and Merkin Concert Hall, will again be performed in May at the Bang on a Can Marathon at the Brooklyn Museum. The work features a heartfelt performance from a children’s choir comprised almost entirely of girls who are poignantly the same age as the young Nigerian women, when they were abducted. Joan has also undertaken a project on Virginia Woolf’s letters, writing, and personal history, in the hopes of weaving Woolf and Cornell’s stories together in a future piece. Through an award from the Guggenheim Fellowship in Music Composition in 2004, Joan was given access to the British Library’s collection of letters and notes. Inspired by Woolf’s communication with Leonard and her sisters, and her powerful suicide letters, Joan delved into a new work that will intimately bring to light Woolf’s words. The opera will focus on Woolf’s “Moments of Being,” the posthumously published collection of autobiographical essays in which the writer explores moments of reality, versus what she considers the status quo of non-reality. The performance will put special emphasis on Woolf’s difficulty processing the death of her mother, and, of particular interest to Joan, Woolf’s dream of creating a time machine. “The Wanderlusting of Joseph C.” and Joan’s relationship with Woolf’s letters mark a wonderful cyclical completion in Joan’s artistic career, in a return to words as a source of inspiration. As a young student, Joan was dually enrolled in the English and Music Departments at Syracuse University, and even recalls an essay she wrote during her studies, in which she explored color symbolism in Woolf’s beautiful novel Orlando: A Biography. This interest in words, however, receded early in Joan’s career, and was replaced by sounds and song that seemed to touch somewhere beyond our language, still communicating volumes, but without speech. In her works today, they have risen to the surface again, in wonderful creative collaborations with artists and writers, both living and legendary. Observing this cyclical narrative illuminates analogies between Joan’s list-making, Cornell’s collecting, and even Woolf’s stream of consciousness, that perhaps indicate an immediate induction of “The Wanderlusting of Joseph C.” into the canon of curiosities. In 1913 composer Maurice Ravel was recorded playing his own piano music using the exotic Welte-Mignon recording process. This was a player piano that captured not just the notes but dynamics and tempos as well. In that incredible year and for some decades forward, many composers did the same, including Paderewski, Busoni, Grieg, Scriabin, and Debussy. The remarkable thing about hearing these is the loose and funky approach they had to the music. Some of these characters made extra cash playing piano in bar rooms and brothels. Imagine The Sunken Cathedral as a barrel house, stride piano romp. Our romantic interpretations go sour. These recordings are an historical marker in our appreciation of the composer as performer. This tradition is ancient but thinly documented. Mozart’s “embellishments” in his live shows are legend, and are preserved in transcription. The practice certainly goes back millennia. Imagine riffing in Gregorian chant, for sure. The Festival of Mixology is Roulette’s celebration of this tradition. Technology meets the hand of the maker. This is key. The composer’s voice is uninterrupted by interpreters or production noise. The MixFest focuses on “new and unusual uses of technology that incorporate sound”. Technology liberates the composer to be more than two hands. Over the last century that has become very interesting. For example, the use of the turntable as a musical instrument. John Cage’s Imaginary Landscape No. 1 of 1939 used variable speed turntables and pre-recorded test tone records. Pierre Schaeffer went further using a disk-cutting lathe, four turntables, a four-channel mixer, filters, an echo chamber, and a mobile recording unit. He is also the first composer to use magnetic tape (incredibly liberating then, but clumsy compared to our digital currency). Schaeffer also started incorporating noises as musical material, which launched musique concrète. Then we have arguably the greatest multimedia event of the twentieth century (though John Cage’s HPSCHD is a close second). 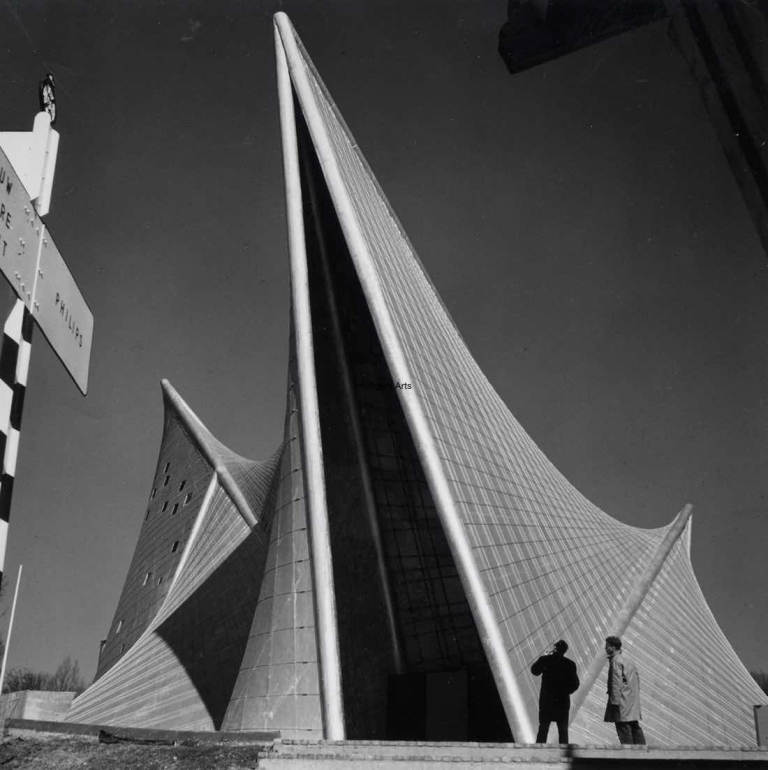 The Philips Pavilion of 1958 in Brussels was designed by architect Le Corbusier, and elevated by the great composer/engineer Iannis Xenakis and the sounds of Edgar Varèse’s Poème électronique (hundreds of speakers throughout!). It combined architecture, multi-channel sound, projections, sculpture, light, and audience interaction. You can’t touch this. They tore it down. My own first experience with electronic music performance was nothing like this. The lights went down and two pin lights appeared on the speakers. In the dark we listened to a spectacle of stereo sound. Years later a revolt occurred. Composer/performers actually appeared on the stage with their apparatus. Diddling and tweaking sounds. Over time this, too, grew tiresome. Watching someone work is a piece you only need to see once. So, composers began to get off the table of gear, with controller gloves and wands and all types of gadgets. What do we need to see? What do we want to hear? This year’s Mixology Festival is an investigation into space. Multi-channel sound can create illusion and wonder and an artful experience. Curator Michael Schumacher has long championed this aural magic. His Diapason Gallery was the longest running, and only dedicated, listening space for sound art in New York. The hand, and the voice, of the maker will be heard. Go listen. David Weinstein is a co-founder of Roulette and curator of the first Festival of Mixology in 1991. He is currently working to restore historic radio broadcasts, digitize the Roulette audio archive, and introduce new artists on his radio show on WFMU. Roulette’s Mixology Festival Runs from Feb 22 – Feb 25 and presents works by: Jim O’Rourke, Olivia Block, Jason Lescalleet, Mario de Vega, Cecilia Lopez, Greg Fox, Stefan Tcherepnin, Eli Keszler, Kenneth Kirschner, Daniel Neumann, Anne Guthrie, Ben Manley, Liz Gerring, Michael Schumacher, Leila Bordreuil, and, Ursula Scherrer. Since 2014, dancer and curator Jennifer Lafferty has invited choreographers to present as part of [DANCEROULETTE]’s New Movement Series. As she begins her fourth season this February, Alexis Convento, curator of the CURRENT SESSIONS contemporary performance series, speaks to Jennifer about the “emerging” artist, non-curation, and fluidity between curatorial and performance roles. Alexis Convento: Hi Jennifer, thank you for taking the time. I’m excited to speak with someone else who moves between artistic and curatorial roles. 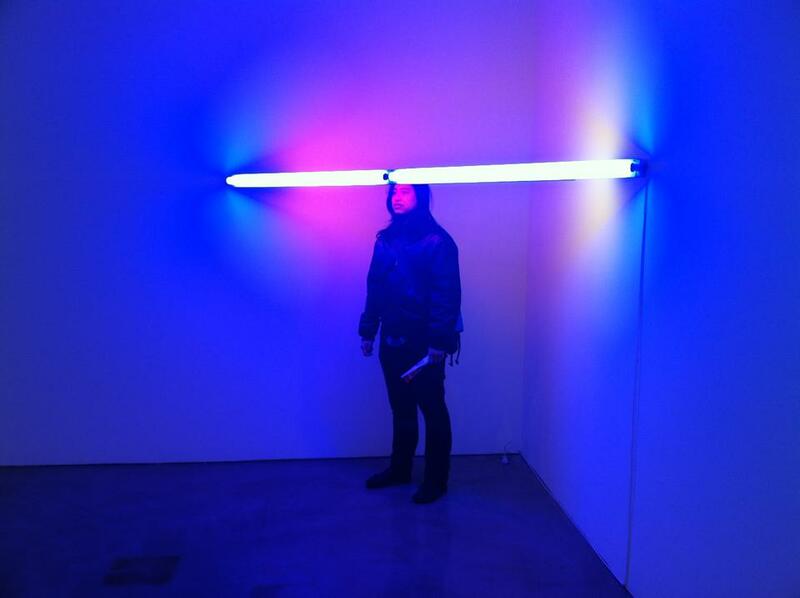 Having experience on both sides can bring a lot to a curatorial practice. To begin, I’d like to learn a little more about how you started with the New Movement Series. Jennifer Lafferty: It was good timing, really. The New Movement Series was my first curatorial opportunity. Most days I still call myself a performer–I work with a number of choreographers, most recently Rebecca Lazier and Beth Gill. But I also try to see as much performance as possible. I love how many ways dance can be presented to the audience. Works-in-progress at Movement Research, mixed-bills at Center for Performance Research, and seasoned choreographers at The Kitchen, New York Live Arts, and The Chocolate Factory… I try to see as much as I can. The city is always changing and filled with good ideas. After each performance, I like to start a conversation about the choreography presented. This is what led me to where I am now. After seeing one another at several shows, a former Roulette curator reached out about programming the New Movement Series. This was back in 2014, and February will now be my fourth series. AC: Yes, great timing. So tell me more about the New Movement Series. What artists are involved? What sets this series apart? JL: The New Movement Series was established as an “emerging” artist platform. I found that term a bit challenging at first and spent a lot of time trying to define for myself who I considered an “emerging” artist. Ultimately I decided to interpret the term broadly and focus on young artists who can create suspense through movement and experiment with different techniques. What’s most important is that I find choreographers who are always curious. It doesn’t matter to me if artists are classically-trained, but rather that they are immersed in a personal practice, and that they continuously explore their craft. AC: –I’m so used to doing just the opposite. Whenever I put together a show I am always searching for a through-line, trying to fit narratives and themes together. It’s nice that you can let go of control in that way. Can you elaborate on what you mean by non-curation? Why is it crucial for emerging platforms like the New Movement Series? JL: There are so many practices out there, I want to let them come into contact with one another. As an organizer, I try to listen and keep an open mind. I also think it’s important to provide opportunities for emerging artists. With New Movement I want to give young artists the space they need to explore, make mistakes, and take risks. To allow room for failure as part of the research in early stages of making. If these choreographers have the opportunity to explore it’s unfair for me to limit their creativity by restricting them to a certain concept, style, or focus. My first concern is to provide the resources, time, space, and personnel, for these artists. What I ask in return is trust, transparency, and a shared commitment to the presentation of great dance for an audience that is curious. AC: It is important to make space for artists in early stages of development. Okay, last question: I feel like this may come naturally for you because you’re often around other artists, but how do you think the part of the curator differs from that of the performer. Do you find it challenging to switch between roles? JL: Luckily, as a performer, I find myself among people who are constantly investigating, pulling apart, and discussing performance in a multitude of ways. This contact allows me to learn about new movement, and encounter artists as they are building work. A question that I often revisit is how much my own aesthetic should read within the New Movement Series. I try to find balance by letting the space between performer and curator remain fluid while organizing evenings that allow for multiple perspectives and entry points. [DANCEROULETTE]’S New Movement Series runs from February 15-18, 2017, and presents choreography by Abby Levine, Anonymous – Cori Kresge, EmmaGrace Skove-Epes, Jessie Gold, John Hoobyar, Maddie Schimmel, Marc Crousillat, Marilyn Maywald, Melanie Maar, Netta Yerushalmy and Marc Crousillat, Rebecca Brooks, and Tatyana Tenenbaum. Mia Wendel-DiLallo: How did you begin playing music? Susie Ibarra: I started studying music at the age of 3. I studied and played classical piano and sang in choir throughout my grade school and in high school. My uncle and aunt had a kulintang set in their house (Philippine bowed gongs). Mostly it was Philippine choruses that would visit our homes during the winter holidays. Not until I moved to New York City did I start to play regularly in Philippine kulintang, and Javanese and Balinese gamelan groups. I also played piano and organ in church. In high school I was invited to play in a punk band 10 days after I got a drum set, when I was 16 years old. My parents allowed me to play performances on the weekends in Houston, Texas. I first heard a recording while in high school of Thelonious Monk’s Dream on a college radio in Houston and a recording of Sun Ra’s Arkestra playing “Pink Elephants.” It influenced my interest for playing and listening to jazz. I came to New York City to study visual arts and languages in college and I brought my drums. Shortly after I began taking lessons on drum set in New York and Teaneck, New Jersey with Sun Ra’s drummer, the late Earl Buster Smith. I started playing jazz and I also used to play solos down by the Hudson River in the West Village. Many of my first performances for events, weddings, etc… were supported by some of the Lesbian community in New York, and also I played small shows, cabarets and in the downtown experimental and jazz scene. These were some of my first experiences studying and working in music. MWD: What does percussion do that isn’t achieved by other types of instrumentation? SI: Percussion can provide those magical rhythms that sync and support other instruments playing in the ensemble. It has the capacity to create drama with one huge range of dynamics, colors, and textures. MWD: How do your humanitarian interests manifest themselves in your work with music, both in performance and installation? SI: Perhaps our humanitarian interests are always there whether subtle or direct. The longer I continue my music practice, like a tree, it has its branches that grow and connect, sometimes break and, if we’re lucky, regenerate. A desire to help others especially if there is a crisis or a definite need is something inherent in so many people. My work archiving and filming Indigenous music in the Philippines over a period of 12 years brought this out. There are so many struggles with the lack of environmental and cultural preservation, issues with climate change, social, and economic inequity, that how could I not become involved in unpacking and addressing the issues? Recently, I started to collaborate on social projects in Brazil with Chef David Hertz, around gastronomy and music for the underprivileged communities. I am about to begin two climate change projects, one scoring a film by Sean Devlin about the story of the Visayas and the displacement and loss after devastating storms. Another is a collaboration with glaciologist Michelle Koppes, which we will begin developing in 2017, where I will be recording glaciers and music communities along the Himalayas, and composing a sonic map for this story of the Himalayas—its glaciers and its communities, particularly along Tibet and India. MWD: What are your thoughts on gender politics as a percussionist? SI: It depends if I am thinking about it as an American or a Filipina, but usually I am trying to listen and think about it from both perspectives to see how one view can live with the other. America is a patriarchal society, while the Philippines is very much a matriarchal society. Percussion music has historically been passed down for the majority by men. In the Philippines, the percussion, particularly gong music, has been passed down through the women, and the string music is traditionally passed down by men, especially in the south, Mindanao. Just as historically many of the great composers in the Philippines have been from the north Luzon and so many of the great singers are from the Visayas in the middle. Our great iconic composer/improviser, humanitarian, and dear friend, whom we just sadly lost, Pauline Oliveros, once told me that when she was a little girl she was asked to go pick an instrument to play in class. She went to pick up the drums and the teacher handed her a flute. Isn’t it strange that we can also place a gender on instruments, inanimate objects? I have been feeling compelled to write something about this more in depth, it is a strange phenomenon that became normalized. It was not an easy time for me growing up. I was definitely a minority as a female percussionist. Also as I taught workshops across the US, I would hear a recurring story of young women saying “ I wanted to play drums but…” and then their story. I think again it is very strange to place a gender on instruments. I am hopeful though that there are more women artists who are playing percussion and drum-set today and support this, of course. I think it is wonderful how people like Mindy Abovitz of TomTom Magazine have been able to feature so many women drummers and percussionists. MWD: Could you describe your approach to sound installation? SI: I am very much interested in both live and immersive music and sometimes connecting them both together in one time-sensitive piece. Sound installation for me is very much a site-specific experience. I am thinking about creating a work that collaborates with what is asked of for the environment, the space, and the community. I am thinking about the people that will visit, walk, and listen and watch the work and focusing on creating music or sound pieces that either fit, or engage in the most optimum way. I recently scored a piece for a speaker installation in Jackson, Wyoming at the National Wildlife Museum 2015 outdoor exhibition of Ai WeiWei’s Circle of Animals Zodiac Heads. Upon discussing with the museum’s curator, it was apparent that although it was a touring exhibit, they wanted a work that was grounded along the sculpture trail. We chose speakers to install along the pathway of the exhibit and I invited sound engineer/designer Wayne Horwitz of the Exploratorium in San Francisco to install the work with me. I also have been exploring possible collaborations and storytelling with modular music app walks in cities. There is one, Digital Sanctuaries, New York City, which engages with twelve historic sites in Lower Manhattan commissioned by the Lower Manhattan Cultural Council and New Music USA, one which engages with poets’ work and a historic walk in North Pittsburgh through the City of Asylum. Publishing in 2017 for iPad and iPhone will be a modular app for architecture and music with Moroccan architect Aziza Chaouni, titled Musical Water Routes of Fez, in the old city, the Medina of Fez, Morocco. This modular app walk connects people to historic sites along historic river routes and fountains in the old city. Fez used to be called the city of 1,000 rivers and many of the rivers were cemented up and became polluted. Surround sound has been an intriguing way to move sound and create another layered environment amidst live performance. One piece, titled Hidden Truths: Prayer for a Forgotten World, which I created during a residency with Harvestworks, incorporates field recordings of seven indigenous Philippine music groups that I have worked with and archived, while live performance, by Electric Kulintang, was in the center of the circle. I also created a surround sound piece at EMPAC in Troy while conducting 80 live percussionists, titled Circadian Rhythms, which incorporated 8.1 surround sound of field recordings from the Macaulay Library of Bird and Animal sounds at Cornell. At the moment I am thinking of scaling a polyrhythm game as a city installation for people to play on. I am very much interested in looking at cities as a creative palette and find them to be a great place for interdisciplinary collaboration, intervention, and creative research. I am also fascinated with the creative practice of mapping in many forms. MWD: How do you see perception embodied in your composition for Dreamtime Ensemble? The pieces for this album were inspired by the idea of perception and sensory experiences. In dealing with the process of grieving and loss in my life I found that it is a time when my senses have been very vivid. I found that in my perceptions I didn’t believe in fairness or justice as much as I believed in goodness and kindness. Some of these compositions are inspired and composed around these ideas which I also found are beautiful spoken about by Lao Tse in the Tao Te Ching. They are titled Goodness, Alegria, Memory Game, The Uncertainty Principle, among other pieces. I composed these pieces from experiences of sensing these emotions, thoughts, actions, or ideas. I also like very much the idea that the perception of each of the pieces can change depending on its interpretation of being played and which musician(s) it will focus on. Susie Ibarra’s Dreamtime Ensemble performs at Roulette on Wednesday, February 8, 2017. Roulette TV sits down with Gelsey Bell and Erik Ruin to discuss their performance at Roulette, the way in which they developed this piece, and how the piece is meant to function for a viewer. Prisoner’s Song is a performance created by composer Gelsey Bell and visual artist Erik Ruin about the prison experience. Using shadow puppets and projections alongside a variety of musical idioms, the piece draws on historic ballads, poetry, audio interviews with people who have spent time in prison, and other primary sources to create a fragmentary encounter with the states of mind and heart prison engenders. What: Roulette winter season highlights include two evenings of free jazz legend William Parker; the return [DANCEROULETTE] and Mixology, two annual winter performance series celebrating emerging and established artists; the continuation of Meredith Monk’s curated performance series featuring American Contemporary Music Ensemble (ACME), Don Byron, Robin Holcomb, and Ellen Fisher; and rising jazz star Tomeka Reid. Roulette is pleased to announce the release of their winter season from January 11 to March 30, 2017. Tickets will be available online at roulette.org or by phone at (917) 267-0368. The winter season kicks off Chicago-based musician, filmmaker, and arts organizer Matt Mehlan presenting “Unlikelihoods,” a suite of new compositions written to be realized in iterations, from the new band Facelessness, followed by back-to-back evenings from legendary free jazz bassist William Parker. Multi instrumentalist and Perfect Wave cofounder Ka Baird will utilize Roulette’s Steinway D Grand Piano to present experiments in solo voice + piano, followed by the return of Moroccan-influenced psychedelic jazz collective Club d’Elf. The premiere of Gary Lucas’ solo guitar score accompanying Orson Welles’ surreal silent comedy Too Much Johnson rounds out the month of January. February will see performances from tenor saxophonist James Brandon Lewis presenting works from his most recent release, No Filter; Brendon Randall-Myers’ Invisible Anatomy ensemble exploring the notion of change through composition, lighting, video, and choreography; and Richard Sussman’s Evolution Ensemble presenting The Evolution Suite for jazz and string quartet. Highlights include the week-long [DANCEROULETTE] New Movement Series curated by Jennifer Lafferty, featuring performances from contemporary dance artists Marc Crousillat, Jessie Gold, John Hoobyar, Heather Lang, Abigail Levine, Melanie Maar, Marilyn Maywald Yahel, Maddie Schimmel, EmmaGrace Skove-Epes, Tatyana Tenenbaum, Netta Yerushalmy, and Anonymous: Pierre Guilbault and Cori Kresge. Roulette’s annual electronic music festival, Mixology, will also make a reappearance with Michael J. Schumacher as curator. The four day festival will witness live performances from Olivia Block, Anne Guthrie, Greg Fox, Eli Keszler, Kenneth Kirschner, Jason Lescalleet, Daniel Neumann, and Stefan Tcherepnin, complimented by nightly installations from Mario de Vega, Cecilia Lopez, and Ben Manley. The final performance of Mixology will feature a dance installation from Liz Gerring with Michael J. Schumacher, Ursula Scherrer, and Leila Bordreuil. The month concludes with performances from avant-garde percussionist Susie Ibarra; musician / video artist Josiah Cuneo presenting The Paper Dance, a site-specific film and performance; a rare performance of Morton Feldman’s 1982 composition For John Cage from the piano and violin duo of Joe Houston and Aisha Orazbayeva; and American Contemporary Music Ensemble (ACME) curated by Meredith Monk. March marks the beginning of Roulette’s residencies and commissions series for emerging experimental artists, featuring performances from saxophone quartet Battle Trance presenting Blade of Love and an evening with Chicago-based cellist, composer, and educator Tomeka Reid. Meredith Monk’s year-long curated performance series continues with clarinetist Don Byron performing works for quartet, singer-songwriter Robin Holcomb, and longtime Meredith Monk ensemble member Ellen Fisher. Taylor Ho Bynum’s PlusTet will perform music from their recent release on Firehouse 12 Records, followed by performances from seven-piece ensemble The Jazz Passengers and Kaufman Music Center’s youth ensemble Face The Music. Kayo Dot frontman Toby Driver will perform two sets of austere avant-folk, first as Madonnawhore, a duo of Keith Abrams and Driver, and secondly as String Noise, an avant-punk violin duo comprised of violinists Conrad Harris and Pauline Kim. The winter season concludes with two evenings of the String Orchestra of Brooklyn’s String Theories festival celebrating 21st century music for strings. The first evening will feature a portrait of composer Anna Clyne in collaboration with Mivos Quartet, followed by a newly commissioned evening-length orchestral work by the composers of the W4 New Music Collective. Roulette TV talks with Bérangère Maximin about the solo set at Roulette, the development of her creative practice, and her relationship to music. Bérangère Maximin’s music engages the listener in considerations of space and textures. Since her debut album, Tant Que Les Heures Passent on Tzadik (2008), she has gradually developed a hyper-personal style, creating sensual, hypnotic, sultry pieces with immediate impact. 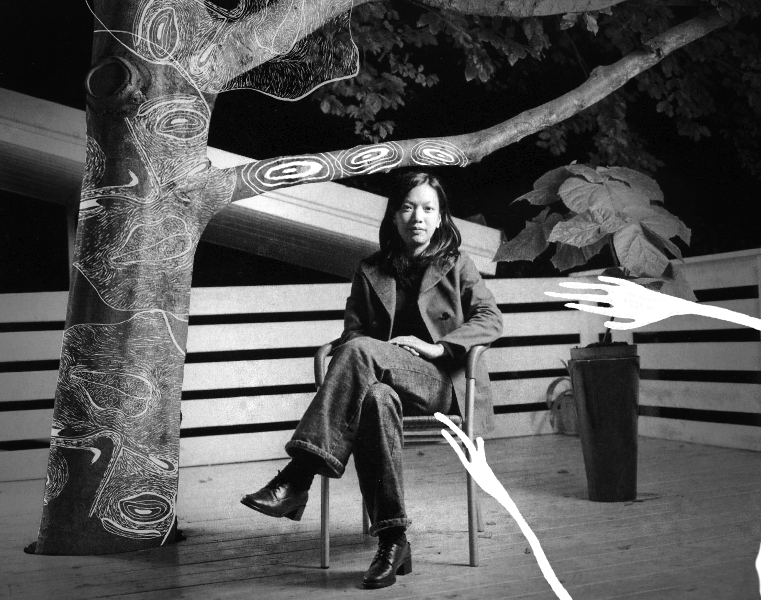 The electroacoustic composer’s repertoire is marked by encounters that have inspired her writing in various degrees. She studied under the musique concrète composer Denis Dufour (a member of the famous GRM and a pupil of Pierre Schaeffer). Taking inspiration from the New York improv scene and her European tour in solo and in duo with the likes of Fred Frith, Fennesz, and Rhys Chatham, her work developed towards live practice, playing with laptops and midi controllers delivering what she calls her digital chimeras. This work led her to compose No One Is An Island (Sub Rosa, 2012), the second and only collaborative album so far, and the confirmation of the respect Bérangère had started to get from established artists. The minimal series Infinitesimal (Sub Rosa, 2013) describes a slow transformation, a deep introspection far removed from the convention of the genre, very special imaginary areas where only matters the physicality of the moment. Dangerous Orbits, out since May 2015, is her first album for Crammed Discs’ Made To Measure series. What: Roulette legend and intermedia artist Phill Niblock presents his annual 6-hour Winter Solstice concert. Brooklyn, NY – As the longest night of the year unfolds and the journey of our planet nears the point when Winter commences in the Northern Hemisphere, Roulette stages Phill Niblock’s annual Winter Solstice concert — six sublime hours of acoustic and electronic music and mixed media film and video in a live procession that charts the movement of our planet and the progress of ourselves through art and performance at its maximal best. Niblock’s minimalistic drone approach to composition and music was inspired by the musical and artistic activities of New York in the 1960s, from the art of Mark Rothko, Carl Andre, Sol LeWitt, Donald Judd, and Robert Morris to the music of John Cage and Morton Feldman. Niblock’s music is an exploration of sound textures created by multiple tones in very dense, often atonal tunings (generally microtonal in conception) performed in long durations. Phill Niblock is an intermedia artist using music, film, photography, video, and computers as his medium. Since the mid-1960s, he has been making music and intermedia performances which have been shown at numerous venues around the world, including The Museum of Modern Art, The Kitchen, The Institute of Contemporary Art in London, and World Music Institute at Merkin Hall. Since 1985, Niblock has been the director of the Experimental Intermedia Foundation in New York where he has been an artist and member since 1968. He is the producer of Music and Intermedia presentations at Experimental Intermedia since 1973 (with 1000 performances to date!) and the curator of EI’s XI Records label. Niblock’s music is available on the XI, Moikai, Mode and Touch labels. He is the recipient of the prestigious 2014 Foundation for Contemporary Arts John Cage award.